Flight Network, online at flightnetwork.com offers travelers savings of 10 to 70% on cheap flights from Canada since 1998. With some of the most sophisticated search technology in the industry Flight Network checks and compares for you all the airline published fares, special "web only" fares, and over 2 000 000 bulk rates that they have negotiated with major airlines including Air Canada and WestJet to find you the cheapest flights. These substantial savings are available for you on economy, business and first class flights, as well as on last minute and mid-week trips. Before you book your discount flights, visit 58coupons for the best Flight Network savings, promotions and discounts. Book with Flightnetwork.com today and get round trip flights for as low as $199. Click link for details. 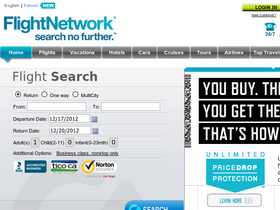 Visit Flight Network today where you can save up to 70% on airfare. Follow this link to get started.